The Broken Glass From A Wedding Can Be Placed Inside The Glass Tube To Create A Cherished Keepsake. With One Tube For The Scroll And One Tube For The Crushed Glass, Each End Is Adorned With 24k Gold Plated Pewter Crowns And Held Together With A Decorative Center Band With A Shin. This Makes A Special Wedding Gift That Will Be Treasured For A Lifetime. 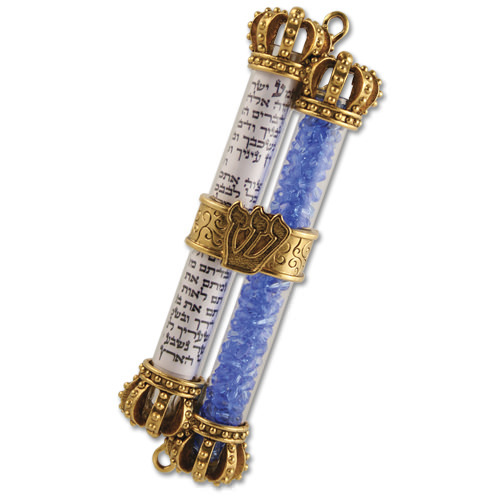 The Crushed Wedding Glass Mezuzah Is 5" Tall. Waited for a special mezuzah for our bedroom and saw the double mezuzah, so special, to be placed in our room for our 50th Wedding Anniversary. Thank you, itâ€™s beautiful. This mezuzah remains as the ultimate spiritual memory in our home. It's construction is perfect and mounted on the doorpost quite easily with a unique idea to always remember that special event. Very happy with quality and size of the Mezuzah!